Outreach takes many forms, some based in the church and some where we work with others - a good example of that is Churches together. St. Luke's has two representatives from the Church on the Committee and always supports and takes part in the community events organised by Churches Together. Each year we take part in a nativity play that takes place on the main street of Formby Village, and over the years have provided a "Joseph", two "Virgin Marys", an "Angel Gabriel" and many other supporting roles. A scene from the nativity play appears at the top of this page. 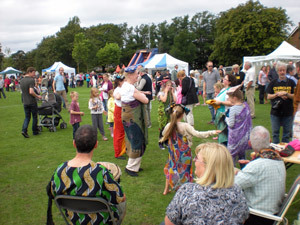 At a free Family Fun Day held in Duke Street Park, St. Luke’s has organised the barbecue for many years, provided Christian Puppets, a Rwandan House and has provided stewards and other helpers. This is an event enjoyed by many people in the community, and supported by local traders who donate various products for the benefit of the community. It brings many lapsed or non-Christian people into direct contact with members of churches of various denominations. Members of St. Luke’s always attend the ecumenical services organised through Churches Together – the service for Christian Unity in January and the Summer Evensong in June, for example. This year Churches Together plan to hold a Songs of Praise service in the Pool grounds on 3rd June at 4 p.m.